6 June - As usual we left home before dawn on a dull morning. After several breaks already behind us, here we are in a picnic area on Bodmin Moor for the final pause (and hot coffee) before heading off on the last part of the journey. 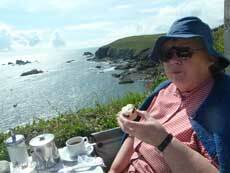 and as soon as we could we headed down to Lizard Point to end the day with a Cornish Cream Tea in brilliant sunshine. 7 June - What a difference a day makes! Today the lizard was being blasted by strong winds and heavy rain, and I got soaked taking a walk along the coast path - but it was worth it! 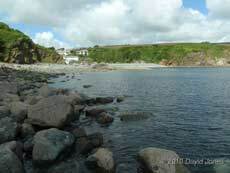 8 June - And the sun was out again - just right to reacquaint ourselves with Porthallow. We got down there at low tide, and with a touch of yesterday's winds just making it across to this side of the peninsular I decided to launch the kayak and test out a sail that I bought during the winter. Called a Windpaddle, it resembles a parachute with a clear panel to see through. It is attached in two places on the kayak and controlled with two lines. It was an interesting experiment, not helped by the fact that the wind was gusting, and soon died completely once I was out on the water! As far as I can tell the kayak paddle needs to be balanced on your lap. Perhaps of more interest, further out in the bay you can see a group of dark grey buoys. These are a new addition since last year. 9 June - Another sunny day, but with the hectic start to the holiday finally catching up with me, we spent much of the day doing nothing down at Lizard Point. 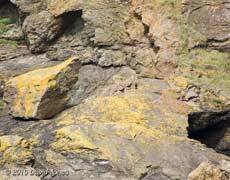 One disappointment about the holiday was that we all but missed seeing any of the Choughs' chicks before they left the nest cave. This was my only glimpse of at least one of them, in an all to distant shot. 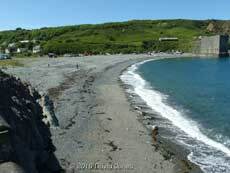 10 June - Another rest day, although the combination of sunshine and a low tide was too much to resist and I took yet another walk along the rocky shore to the south of Porthallow Cove before having a meal down on Lizard Point. 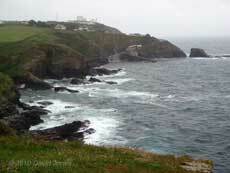 11 June - Another restful day down at Lizard Point. 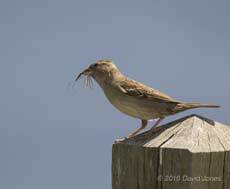 When we left home the House Sparrows were busy providing food for their chicks, and the same goes down here. While the Sparrows are regular scavengers in the outdoor area of the Polpeor Café it was clear that this female was more interested in catching a protein meal for her offspring. 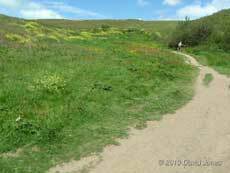 With no sign of the Choughs about, I took a walk along the first bit of the coastal path as far as Pistil Meadow. An area of luxurious plant growth, it lies where a short valley meets the cliff. 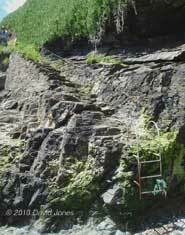 The person you can see in the top-right corner is about to pass under a canopy of conifers and cross a small stream before ascending a set of steep steps at the cliff edge. Green as it is, the meadow is the unmarked burial place for some 200 people who perished when the troopship Royal Anne ran into rocks off the headland in 1720. To the right of the path is a way down to the rocky foreshore, an area closed to the public while the Choughs are nesting. With the nest now empty it was possible to get down there at low tide. This is the view looking back from the water's edge. At the top-right you may just make out the fence at the side of the steps, with the trees at the centre. The dense green mass just left of center is the invasive Hottentot Fig. Move back towards the cliff and you can just see a piece of ironwork below the Hottentot. 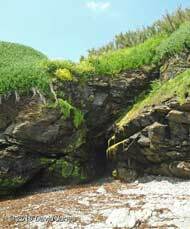 Right at the back of the cove (which is called Pystyll Ogo) is the reason for the name - Pystyll (Pistil) is the Cornish for 'waterfall'. It's not quite on the scale of the Niagara Falls - By the time the stream reaches the cliff edge it has spread out to create quiet a wide wet zone, but with little more than water dripping down from a rock overhang. 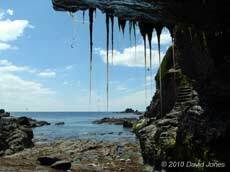 Mind you, on a hot summer's day this provides about the coolest spot within reach of Lizard Point, other than being in the sea, of course! And what about the ironwork? That marks the lower end of the access steps to the cove. 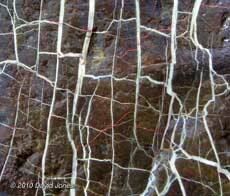 The steel cable is absolutely essential, especially when the rock is wet and slippery! 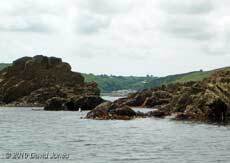 12 June - A quiet day, with a trip down into Porthoustock Cove (a short was south of Porthallow). 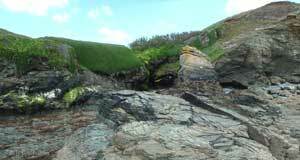 Porthoustock is the site of one of just two working coastal quarries on the Lizard. The quarry, on the right of the picture was closed for many years, and when our sons were young it was a good place for wildlife. However, the demand for road stone made reopening it profitable. 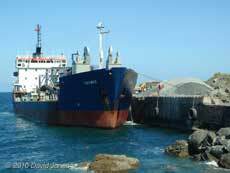 This ship is likely be take the stone to a port somewhere along the south of England. Look back across the cove and you can see the local fishing boats stored high on the beach, sheltered by the remnants of a much earlier quarrying trade. I must take some better photographs of that structure. so it was out on the kayak once more. I'm not sure why I fitted the Windpaddle as there was no chance of using it. 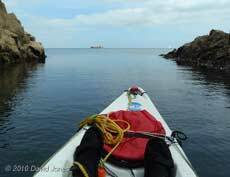 With supplies in the form of a couple of bananas and water, and plenty of time, I set off along the coast to Nare Head and with the sea conditions remaining perfect I went on to the National Coastwatch Station at Nare Point. Run by volunteers, this records boat (and kayak) movements in Falmouth Bay. They welcome visitors, and from them I learned that the grey buoys off Porthallow mark the position of a trial site for new mussel beds. As you approach Nare Head on the return journey, if the state of the tide is right you can get a decent picture of Porthallow between the rocks. This was today's attempt - the spire of St Keverne church can be seen on the skyline - a useful landmark for sailors. For me this is a long trip, even in these perfect conditions, so it is usually a longer return journey, especially if I head for land a few times. 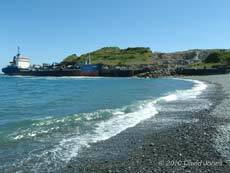 When I stop in a cove I usually wander the strand line looking for rope, or anything else that may have been washed in. On one of my stops this time I was in for a surprise, because as well as the usual rubbish just above the Spring high water mark was this skull - of a male Roe Deer. There were other bones, but I left those with the intention of returning on another day. 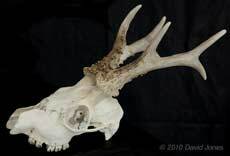 The antlers are about 19.5cm long, a bit small for an adult on which they may reach 25cm. While Roe Deer seem to be widespread in eastern Cornwall, there appear to be few sightings here on the Lizard. The presence of other bones on the strandline suggests that the animal was possibly washed ashore intact, but they must have been there for a while as they were all as clean as the skull. If I had taken a container with me I would have collected more than just the skull. 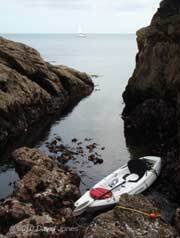 14 June - After yesterday's adventure the kayak remained firmly attached to the Discovery, despite similar sea conditions being awfully tempting. Instead, some of the day was spent down at Lizard Point. 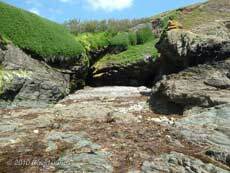 A low tide did tempt me down the hill into Polpeor Cove with the prospect of visiting rock pools. However, that was a foolish plan, and before long I needed to take a long rest before heading back up a slope that now looked twice as long! While down in the cove I recorded an interesting convergence. 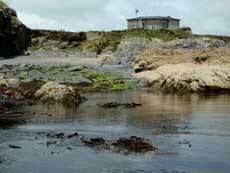 The old lifeboat station which had operated in one for or another since 1859 closed in 1961 when a new station was built in Kilcobben Cove on the sheltered eastern side of Lizard Point. 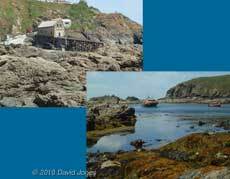 That is now being rebuilt for a new, larger lifeboat, and in the meantime the present boat is being moored back in Polpeor Cove. 15 June - The good weather continues but the Kayak remains secured. We had a relaxing time watching the world go by down in Porthallow before heading back over the Lizard Point to have a meal in the Polpeor Café. When I wander on rocks I'm always on the lookout for interesting patterns, and the foreshore to the side of Porthallow Cove always obliges. In one area in particular you can see numerous boulders showing this criss-cross veining. 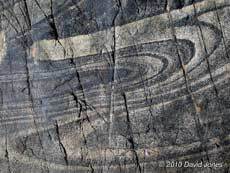 Often, it seems that the material making up the veins has eroded away, leaving the stone standing up in what looks like a chaotic pattern of small blocks. 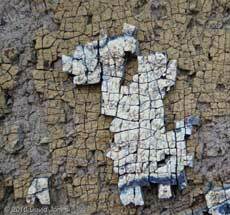 These blocks in turn break off leaving designs that could easily find their way into some art studio. When I look at this example I can't help seeing a dragon. On the left you can see that a second layer of erosion is also underway. This rock shows something of the mixing that when on during its formation - it reminds me of chocolate marble cake! 16 June - I couldn't resist the call of the sea any more and headed out with the promise not leaving the area in front of the cove. 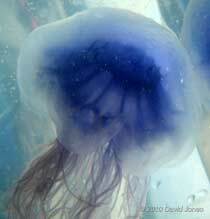 That proved far enough when I found some Cyanae lamarkii jellyfish to take a look at. I 'captured' one in a container and brought it back ashore. I'm afraid the photographs are rather poor. 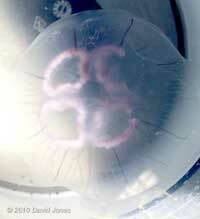 The container was rather too small, leaving little space to get the Olympus under water and focus on the jellyfish. As this species can give unpleasant stings I wore rubber gloves. 17 June - Another, shorter jellyfish hunt today was rewarded with a Moon jellyfish (Aurelia aurita), but was at the same time a bit of a disaster! The seas was not so calm but with us intending to go home in a couple of days it was likely to be my last outing. Then, as I got onto the kayak I managed to twist awkwardly and hurt my back. I sat on the kayak for a few minutes and decided to continue out. All was well until I collected the jellyfish and returned to shore. Getting off the kayak was interesting to say the least, as was getting it back up the beach some time later! Anyway, I was determined to take a few pictures, albeit with similar problems to yesterday. Notice how different the colours look when compared with that first picture, taken by holding the camera in the water at the side of the kayak. 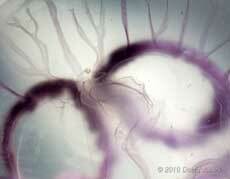 The pink horseshoe shapes are the gonads (reproductive organs) of the animal. At first glance one of the most striking difference between this species and yesterday's example is the lack of tentacles. 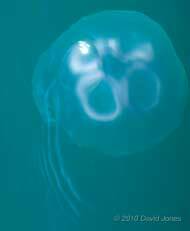 In the Moon Jellyfish you need to look much more closely. In a healthy specimen you will see that the margin of the bell has a fringe of very small tentacles. I'm not sure if the tentacles seen in the centre of this picture are examples of these. Also, this specimen was missing a group of four elongated arms that should surround its mouth. The Moon Jellyfish feeds mainly on plankton which gets caught up on a mucus layer that covers the body, and the small tentacles help move the mucus towards the mouth. Anyway, today very definitely marked the end of kayaking, and even rock walking this holiday! 18 June - A bright, sunny but very uncomfortable day with the only trip out being to the Polpeor Café for a meal. Just about every time we head to Lizard Point we take the road that crossed east-west across Goonhilly Down, and I nearly always have a camera with telephoto lens attached ready. 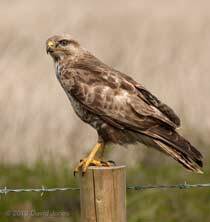 I do this because either side of the road there is a ditch beyond followed barbed wire fence, and often we see a Buzzard perched on one of the posts as it hunts voles. For much of its length the road is straight with few places to pull off, and inevitably when we see a Buzzard there are other cars about and it flies off before we get close. However, as we returned to the bungalow today we were treated to the best encounter ever. 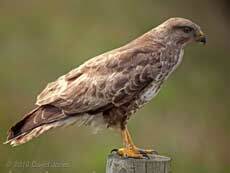 It was on a post on the opposite side of the road to us, and the flat ground meant that I saw it in plenty of time. 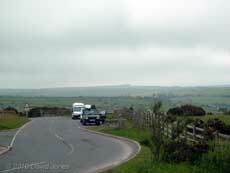 With no other cars about I slowed to walking pace and to my amazement it more or less ignored us. Then it leaned forwards and swooped down to the ground. It was soon up on the next but one post and we crept forward again. This went on for about eight minutes before it took off and flew across right in front of us. But the encounter wasn't over because now it landed on a post on our side of the road. Now it virtually filled the camera frame, I was feeling the effects of all the twisting, and it was one of those time when I wished for a lens with image stabilization! Looking closely at the images later, a bit of image shake does appear, but under the circumstances I'm quite pleased with the results. After rather more than ten thrilling minutes, during which half a dozen cars went by without disturbing the bird, it was time to get comfortable again and head back to the bungalow. 19 -22 June - Having planned to go home on the 20th we stayed two more days before I was comfortable enough to face the long journey home, There were no more pictures taken, but at least we could have been stuck in a far worst place! Apart from the first day we have seen no rain, and despite the back problem it has as always been a pleasure to be here again. And having decided to replace the Land Rover Discovery this summer, this was to be its last long journey home!